Easy to Sell: Generate the least amount of profit per case but are arguably a bit easier to sell to the broader community. Most Affordable: Well suited for a fundraising campaign that targets the broader community rather than the families, friends, and neighbors of your participant. 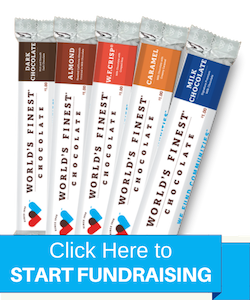 While most people are familiar with World’s Finest® Chocolate’s $1 bar fundraisers, we also offer a great assortment of fundraisers for $2 as well. Our $2 bars are larger than our $1 bars, and come in the same best-selling flavors. In addition, we have delicious chocolate covered almonds, chocolate covered raisins, mints, and boxed caramels available for $2. There’s something for everyone! Generate profit more quickly than $1 products and most people still find the pricing reasonable. Sell less product and make the same amount of money. Fewer case sales generate the same amount of profit. Greater variety of chocolate products. In addition to our popular chocolate bars, we also have boxed chocolates available. Excellent Value: Both our $1 and $2 products are made of premium quality chocolate, and are sized appropriately so you get maximum value for your purchase. Repeat Customers: There’s always a reason to buy more. Unlike wrapping paper and other household goods you can purchase through fundraisers, our chocolate bars will not sit around your supporter’s house, unused. They’re so delicious that people will consume them right away and have a reason to buy more from you! Exclusive: You can’t find them in stores. Our fundraising bars can’t be found in retail stores like some of the other brands out there, so your supporters know they are getting something special.